The motivation behind a GPS tracker is to distinguish, secure, and after that track a question. It can be a man, auto, place or anything that has been labeled by a GPS gadget. It is likewise used to log helpful data. I have a poor ability to read a compass and have a tendency to overlook which approach to go in the parking area constantly. I am cheerful to state I am not by any means the only one however. 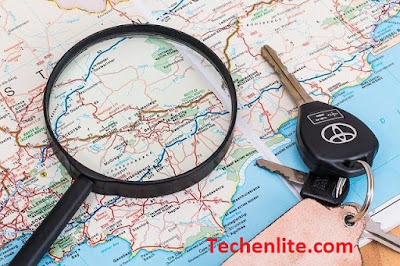 In the event that you resemble me, you will discover these GPS tracker apps for Android valuable in those dubious circumstances. Glympse forever changed the way you share your location with friends and family members. It is so simple, my grandmother could use it. The way it works is simple. You can send a Glympse, as the developers like to call it, to anyone. The app will create a link that you can share with anyone. The recipient need not have the Glympse app installed. He/she will only need an active Internet connection to view your location. Sweet. 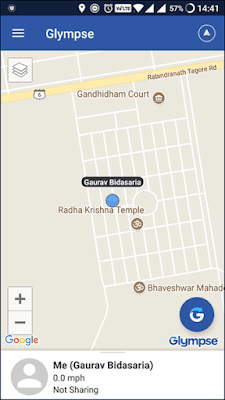 What I like about the app is the ability to create a temporary location link. So, after the set time expires, the recipient will no longer be able to view or track you. There is no sign up process involved. The app is free and there are no ads. I used it to call all my friends to this amazing (read scary) ride in Imagica last week. It’s a theme park in Mumbai. GPS Logger is a cool little app with a very very red interface for some reason. The app will log your coordinates, location, and altitude in a kml or gpx file. GPS Logger made the list because it is open source and free. No ads. You can create placemarks to tell others where you are at. The altitude can be corrected manually if the auto correct fails to update using NGA EGM96 Earth Geoid Model. In my experience, you will need to use the manual one because sometimes it may not connect. It will also measure speed and distance traveled which can be useful later. Finally, the results can be seen in Google Earth which makes the route look way more cooler. While Glympse makes it easy to share your location with others temporarily, Family Locator makes it easy to track your family members on the move. You begin by creating a group called Circle where you can add your better half, and the kids. You can also use this for friends. The app will then show their location in real time. What I like about the app is that you can also chat with them. The app will notify you when the person concerned reaches his/her destination. You can also use the app to find your mobile devices if you haven’t registered it on Google already. The app is intelligent can notify family members or friends in emergency situations like car crash. Family Locator does it by analyzing and recording your driving habits. The free version will allow only 2 check-ins while the pro version, with all features unlocked, will cost you $2.99/month. GPX Viewer will turn your droid into a GPS navigator in no time. It will help you track waypoints, routes, and locations using kml and gpx. You can quickly annotate and mark your map in different colors and markers to help others find and connect with you. GPX Viewer was built for those who regularly find themselves going on tracking and field trips. Outdoorsy type? You will love this app. You can also log your coordinates, speed, elevation, distance, temperature and even heart rate. I am in the habit of using Google Maps as my de facto choice of navigation app. You might have other favorites. GPX Viewer plays nice with all of them. A real team player! The pro version, cost $5.49, will allow you to save maps and data offline for when you are deep inside the Amazon rain-forests or when there is connectivity issues. It will also use OpenStreetMap. You are planning to go for a hike. You will be taking photos along the way. You need a way to track your moment, log coordinates and tell you where you took the photos. Got you covered. GPS Logger is a small app that will run in the background. You can specify the intervals and the app will automatically log entries on a file in your SD card. It will capture latitude, longitude, and altitude with time so you know where you took the photos and which route did you take. You can also tell the app to log entries by distance interval. It comes with cloud support for Dropbox, Drive, FTP, and email. This app is free and comes with no ads. Love Twitter? Like to record audio and video along with your tracking details or maybe add a picture? Open GPS Tracker can do all of this which is why I decided to share it here. Apart from logging your coordinates from your Android, you can also share a summary of the events in a tweet. The app will allow you to record your adventurous journey in images, audio and video format. There is also a way to add text if you like messages. The app is free to download and comes without ads. Not exactly a logger but more of a dedicated tracker, Find My Device is a GPS tracker app by Google. 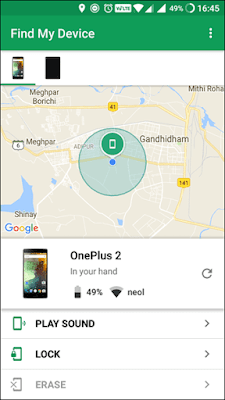 As the name suggests, you should install and use this app to find your Android smartphone. I installed it on my mom’s phone because she keeps forgetting it everywhere. You can make it ring, send a custom message to flash on screen, wipe data on device and SD card, and locate the device on a map. Again, totally free one. These are some of the best GPS loggers and trackers for Android smartphones. Different apps for different uses and scenarios. Which ones are you using?